1) Roksanda Ilincic Olya Twisted Wool-Crepe Dress, now £253.75, The Outnet – Slinky and bogey green, it’s virtually designed for a pasty redhead. Like me. Or Christina Hendricks. 2) Rakel Angora-Blend Sweater, £180, Net-A-Porter – The one that started it all. SIGH. A big slouchy angora jumper in a perfect shade of chartreuse. OH! 3) Suede Block-Heel Shoes, ¢150, COS – You can always rely on COS to take a moderately manky colour and use it to create something smashing. 4) ACNE Kit Ribbed Angora-Blend Beanie, £95, Net-A-Porter – Another smasher from ACNE. There are few words to describe how much I would like to wear this. Red (hair) and green (hat) should never (always) be seen. 5) STRANGEBEAUTIFUL Lime 10 Super Chroma Nail Polish, £18, Liberty – These polishes are taking the beauty world by storm at the moment and boast a whole library of shades. Lime green FTW, of course. 6) Aila Spike Me Mini Bag, £240, My-Wardrobe – I first spotted this in Company magazine. Company magazine! It’s no wonder that thing looks so great at the moment when they’re featuring things like this. 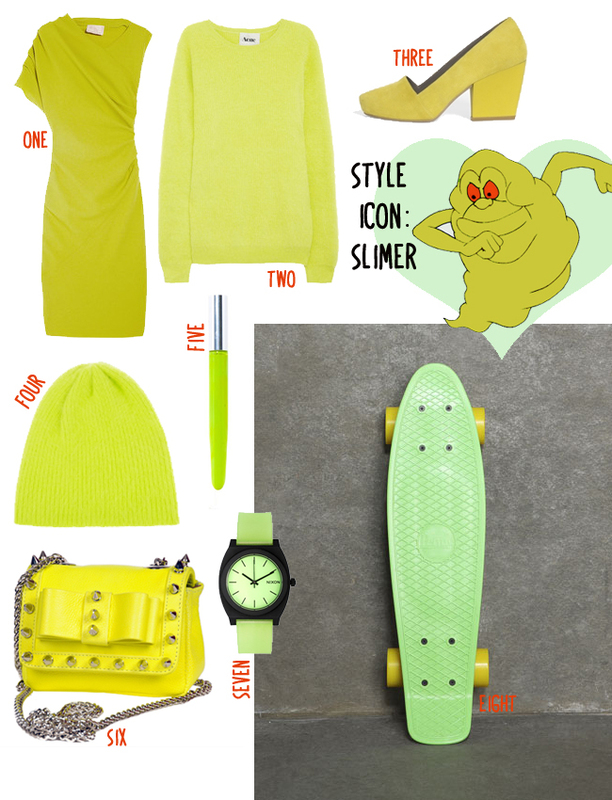 7) Nixon Glo Green Watch, £65, ASOS – Anything glow in the dark gets a Slimer thumbs up. 8) Penny Original 22″ Green And Yellow Skateboard, £80, Urban Outfitters – The original vinyl skateboard, dating back to the seventies – presumably the rubbery grip helps you not to fall off.